Last autumn I bought a Samsung Galaxy phone running the Google Android operating system. I’ve been really impressed with all the features so far, especially it’s excellent integration with the Google suite of applications including Gmail, Reader and Maps among others. While you can check out the data on your phone, or upload the data to a google docs spreadsheet. 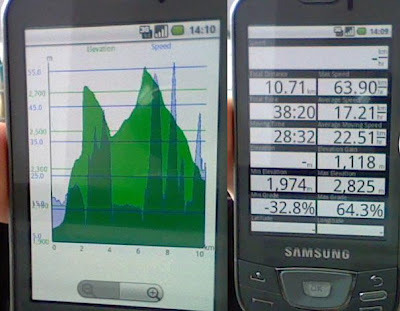 The data is really good fun, especially if you are interested in how far, how high, how fast etc., and it’s potentially a terrific training tool for cyclists, runners and other outdoor sports athletes. For many skiers the saved map from Val d’Isere to Tignes Val Claret via Borsat Express may not be very interesting, however, the possibility of mapping off-piste tours to then share with others is seriously exciting and the same could be said for hill-walking routes, mountain biking trails, or cross-country ski tracks, etc. If I had one criticism, it is that the GPS really drains my phone’s battery, though I can’t blame that on Google. It’s Samsung’s fault. I hope I can start posting a heap of interesting routes here on the blog, to compliment my occasional photos or videos from Tignes. If you’re looking for a new phone then get your hands on the Google Nexus One so you can start mapping your own ski adventures. Sweeping statement of the week: In five years no-one will have an iphone. This entry was posted in Android application on March 6, 2010 by Rorie.